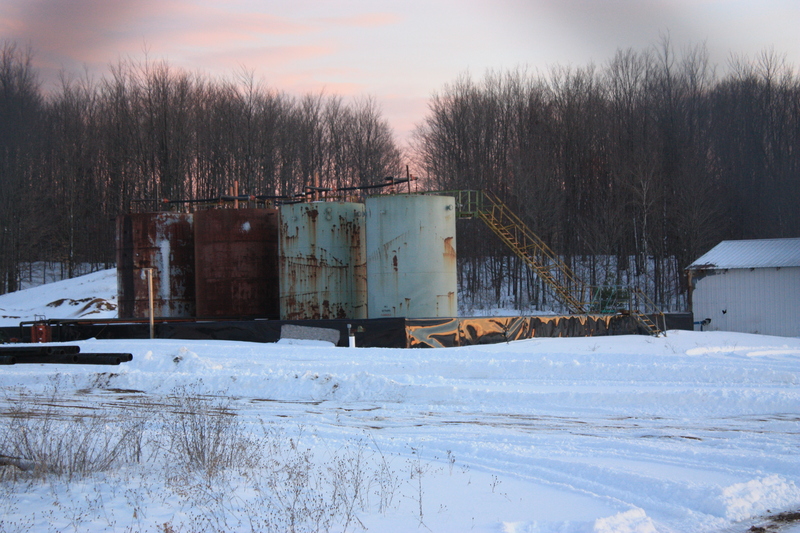 One of approximately 887 injection wells used to dispose of oil and gas wastes in Michigan, the Slowinski injection well in Kalkaska County. Photo by LuAnne Kozma. We call on EPA to reject DEQ’s application and discontinue permitting of new injection wells in Michigan: Neither DEQ or EPA are credible or capable. The Flint River depicted in a 1920 post card. The writer of the card says of Flint on the back, “This is a beautiful clean city.” Postcard courtesy LuAnne Kozma. While the State of Michigan was blowing off the entire community of Flint’s complaints about contaminated water last August, it was also applying to the U.S. Environmental Protection Agency to be in complete control over the state’s toxic waste injection wells under the Safe Drinking Water Act. If EPA approves the State’s application, it would be disastrous for Michiganders and our water resources. Numerous investigations have publicized the responsibility of both the Michigan Department of Environmental Quality and the EPA’s Chicago-based Region 5 in the water crisis in Flint, after Flint’s state-appointed emergency manager Darnell Early switched the city’s water source to the Flint River in April 2014. On February 9 the state attorney general announced an investigation into possible criminal acts including manslaughter charges against a range of Michigan public officials. Two in the cross-hairs will be Governor Rick Snyder and the former DEQ director Dan Wyant. Targeted also could be EPA officials in Chicago, including Region 5’s former director Susan Hedman. Both Wyant and Hedman have resigned in disgrace over failure to enforce provisions of the federal Safe Drinking Water Act and for their roles in the #FlintWaterCrisis. They and other key players including Gov. Snyder will soon testify before Congress. Diagram of the two types of underground injection well for oil and gas industry wastes. EPA illustration, in the public domain. Michigan DEQ drafted a plan in 2014 to acquire even more power over safe drinking water enforcement. In this case the subject was “class II” injection wells, wells drilled into the earth where gas and oil industry toxic liquid wastes are put down into geologic formations. Not actually containers, these porous formations are the resting place for some of the nation’s worst toxic wastes. Old oil and gas wells are sometimes pressed into service as disposal wells. The wastes going underground include the chemical stew of the fracturing or acidizing fluids shot down into oil and gas wells combined with additional, salty and sometimes radioactive liquids and chemicals already below ground that all return to the surface during oil and gas extraction. They are massive in volume. Currently both Michigan DEQ and EPA have to sign off on a new “class II” injection well permit. Now DEQ is seeking what is called “primacy.” This means, DEQ would have sole power and authority over all decision making and enforcing of federal laws regarding injection wells with little EPA oversight. 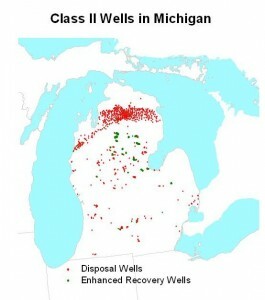 There are about 1286 class II wells in Michigan. … The State of Michigan is well equipped for Class II … primacy, understanding state specific geography, geology, cultural, climactic [sic], social, and economic issues. … The State of Michigan’s record of accomplishment for excellent environmental protection and regulation for Class II injection will continue under the delegated authority, and the DEQ will continue to provide good customer service to the regulated community and public. Of the 1286 class II wells, 887 of them are for disposal, and others are for enhanced oil recovery. Structurally, there is no difference between a disposal well and a gas or oil well. DEQ then announced a “public meeting” would be held on December 9, 2014, to discuss the plan. Whether public comment would be allowed there was ambiguous, in the announcement. When the “public meeting” started, DEQ announced to everyone’s surprise that it would hold a “public hearing” first. The two are very different, particularly in the legal requirement that a “public hearing” have advance public notice and that a formal record be made. Later we filed a formal objection to DEQ assuming primacy in injection well regulation. We argued there had been no proper public hearing, Michigan and EPA have different definitions of “injection well,” and DEQ had advanced no reason it should have primacy other than that it wanted the power. Amid all of this dual-agency denial, and with no publicity DEQ submitted a draft primacy application for injection wells to EPA Region 5 last August. The centerpiece was a “memorandum of agreement” set up for the signatures of Dan Wyant and Susan Hedman. It calls for DEQ and EPA to “maintain a high level of cooperation and coordination … to assure successful and effective administration.” Page 1 of the 383-page package has space for an endorsement letter by Governor Snyder. A week later Flint citizens submitted 26,000 signatures on petitions asking the city to end its use of the Flint River for drinking water. In September Hurley Children’s Hospital in Flint published a study documenting the increased lead levels in children’s blood. DEQ’s contemptuous answer was: Repeated testing indicated the water tested within acceptable levels. So DEQ’s record with safe drinking water law is far from “excellent,” and EPA’s complicity in the whole affair is now part of a federal investigation. Michigan DEQ has no business asking for primacy over injection wells and asserting the agency has a stellar record protecting Michigan people under the Safe Drinking Water Act. As ProPublica’s 2012 series of investigative reports on the nation’s underground injection wells revealed, there is the growing problem of leaking. The assumption that these toxic materials will remain safely entombed underground forever is mistaken. In “Injection Wells: The Poison Beneath Us,” former EPA technical expert Mario Salazar remarked that “In 10 to 100 years we are going to find out that most of our groundwater is polluted… A lot of people are going to get sick, and a lot of people may die.” Salazar worked with EPA’s underground injection well program in Washington for 25 years. Jessica Ernst’s work, A Brief Review of Threats to Canada’s Groundwater from the Oil and Gas Industry’s Methane Migration and Hydraulic Fracturing, details hundreds of studies, reports, and other evidence of widespread well failure and water contamination in Canada and the U.S.
Injection wells proposed for Michigan townships over the past few years have been met with intense public outcry. When “enough” people request a public hearing of the EPA, they hold one. While EPA is predisposed to permit an application if it meets all criteria, in some instances, when a community rises up and makes a show of force at a public hearing, and other political pressure comes to bear, communities can defeat an injection well in their area, but it’s tough going. In Fork Township in Mecosta County, the EPA held a hearing in late January. About 200 people showed up at a local high school. Fifty people spoke, all in opposition to the well. This well is pending and the community continues organizing to oppose it. In White Lake Township in Oakland County, residents rose up in opposition in late 2014 to a proposed injection well by Jordan Development. After residents inundated the township offices with calls, the company backed down prior to an EPA hearing being held and withdrew their application. Without a local notice of the pending EPA hearing, residents would never have known to complain at all. In Summerfield Township in Monroe County, a similar story played out. Residents packed an EPA hearing in the local school auditorium in May 2015 and spoke out in opposition to a planned injection well by Trendwell Energy. The karst topography of the area played a role in providing a substantive reason for not putting an injection well there. After sustained opposition and public pressure, as well as pending legislation in Lansing to ban injection wells in karst topography, Trendwell pulled out of the project. Monroe County is now considering a county-wide ban on injection wells. If Michigan were granted primacy by EPA, the DEQ would be able to hold hearings, but it would be up to Hal Fitch, assistant supervisor of wells to determine whether there was adequate public interest to hold such a hearing. And because DEQ must follow the state law to “foster the development” of the oil and gas industry), approvals on injection wells would go industry’s way. And DEQ would be the final word. Public hearings would be a sham. This part of the state law (MCL 324.61502) is being challenged by Michigan voters by ballot initiative. See the Committee to Ban Fracking in Michigan’s brochure at: www.letsbanfracking.org. The campaign continues with signature-gathering through June 1, 2016. (The Committee’s leadership includes the two of us). Other evidence of DEQ’s lax well enforcement has now emerged, uncovered in a report last month by Michigan Environmental Council. Gas storage wells in Michigan are of the same type as the one that spewed enormous quantities of greenhouse-gas methane in the affluent Porter Ranch neighborhood of Los Angeles for four months this winter. Michigan has more active storage fields than any state, and even more are coming. Some aging wells and pipes haven’t been replaced since the 1940s. Odorant is not added to gas in the Michigan fields, making it hard to detect leaks. A disaster involving thousands of evacuations like that at Porter Ranch could happen here, according to an expert quoted by MEC. MEC interviewed Hal Fitch about this. Fitch is DEQ’s assistant supervisor of wells and directs the Office of Oil, Gas and Minerals. He served for many years under the supervisor of wells, DEQ director Wyant. The timing isn’t clear, but it appears the interview was just before or after his boss Dan Wyant quit. The federal safe drinking water act includes only liquid storage, not gas storage, under “class II” injection wells. Today DEQ has exclusive authority over gas storage, so the primacy application will not affect that. Even so, Fitch’s admission belies the DEQ claim it has an “excellent” underground environmental record. It was only last month that we learned DEQ had finally submitted the draft application to EPA Region 5 in August 2015. We obtained a copy and uploaded it to our site so anyone can review it. On January 29 we wrote Region 5 director Hedman complaining of the omission, and asserting our objection should be made part of the EPA record. That was her last full day on the job. The letter added two additional reasons Region 5 should deny DEQ’s application for primacy, given its mishandling of the Flint water crisis and its lax regulation of gas storage wells. The injection well in Grand Traverse County where frack well waste from several wells is taken for disposal, Weber 4-4. Photo by Ellis Boal. January 2012. So who should issue injection well permits? The request exposed a glaring problem: If DEQ is denied primacy then EPA Region 5 continues in command. But Region 5’s handling of what happened in Flint is just as outrageous as DEQ’s. Citing the widely-reported history, our letter to Hedman noted that Region 5 had memos in its hands about Flint’s water in February, April, and June of 2015. Despite danger to children, the Region 5 office sounded no alarms. Hedman claimed at first that EPA had no power to act, saying only the state could. But in fact under the federal law, the EPA had oversight responsibility and emergency powers to intervene. Soon top DEQ officials began resigning. A month later Hedman herself announced she would quit. Finally EPA issued an emergency order and is running the show but not from the Region 5 office in Chicago. It’s being handled in DC. In addition to Michigan, Region 5 includes Minnesota, Wisconsin, Illinois, Indiana, and Ohio. DEQ should withdraw the primacy application. But if it persists with a formal application and Region 5 gives the expected preliminary green light, a public hearing will be announced — presumably a real one this time — for later this year. Is the purpose for Michigan DEQ having “primacy” to increase the amount of waste being dumped in Michigan? It seems so. Injection well programs take place in 32 states, with the majority of wells around the Great Lakes and in places where gas and oil is produced like the Gulf Coast, California and Texas. Ohio is a state that has primacy for injection wells, with no EPA oversight. Injection wells there are multiplying. People in Ohio have been alarmed that they have been targeted as a regional center for toxic frack wastes from out of state as well as from the numerous frack wells within the state. According to a 2015 report by Earthworks that looked at the failures of oil and gas waste practices in four states–New York, Pennsylvania, Ohio and West Virginia–the two states with primacy (Ohio and WV) had the most injection wells, with about 200 and 60 respectively, while New York had only 6, and Pennsylvania 10. In contrast, Michigan leads them all with approximately 887 disposal wells. With primacy, Michigan will become even more loaded up with class II injection wells and their deadly load. A new injection disposal well for Redding Township (Clare County) was applied for today. America’s dirtiest secret: how billions of barrels of toxic oil and gas waste are falling through regulatory cracks, by Jefferson Dodge and Joel Dyer, Boulder Weekly, March 13, 2014. Fracking wastewater is big business in Ohio, by Kathiann M. Kowalski, Midwest Energy News, July 18, 2014. No time to waste: effective management of oil and gas radioactive waste, (no time to waste-2), Western Organization of Resource Councils, 2015. 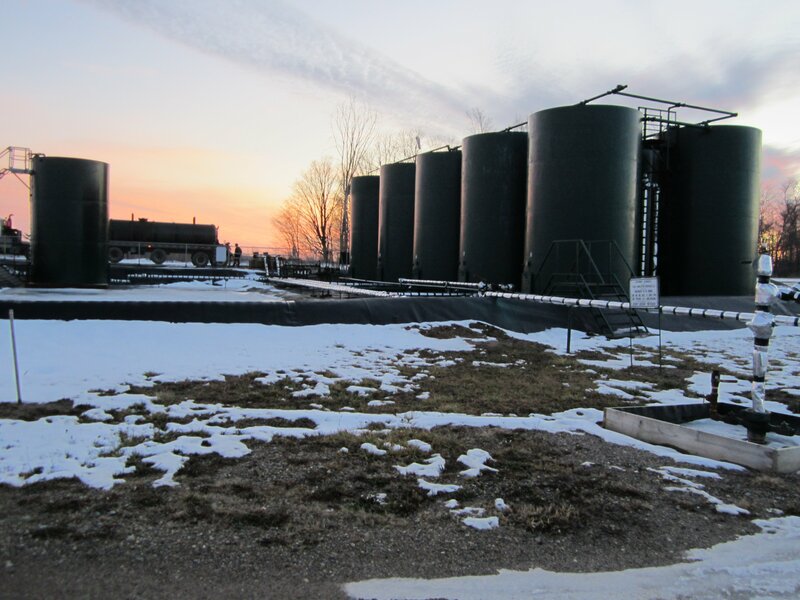 Wasting away: four states’ failure to manage gas and oil field waste from the Marcellus and Utica Shale, by Nadia Steinzor and Bruce Baizel, Earthworks, April 2015. *NOTE that some of these reports propose regulatory solutions. Ban Michigan Fracking’s position is instead on a BAN: that these wastes must end and the processes that produce them must cease. Fracking and injection wells can’t really be “made better” because the fixes do not prevent harm.